Many of you who have been following the "who is" thread in the Master Forum will know that Virginia Parker, who played the fair maiden Robert saves in The Song Remains the Same, popped by to introduce herself to us die hard Zep fans. Many of you might also know that after her modeling career ended Virginia was a journalist for over 20 years and in 2001 became a fine art painter. When she introduced herself to us, Virginia provided links to her websites which display her artwork. I took the opportunity to visit the websites and was absolutely blown away by what I saw. Her artwork is absolutely stunning. I immediately contacted her and asked whether she would be interested in doing a commission for me. There was one catch. I wanted the commission to have a Zeppelin theme. My initial idea was for her to paint a portrait of herself as she looked in the film, but she advised that she is not really a portraitist and although she had done some portraiture in the past it was more experimental than anything else. She recommended that if I want to proceed, we do a still life of various objects relating to the film or Led Zeppelin in general. This sounded like a great idea to me. So we agreed to proceed. We decided that we would take an approach where the finished product would not scream Led Zeppelin, but would be dripping with hints and clues and obvious to those "in the know". Over the next few days and weeks she quizzed me about all things Zeppelin. She had me tell her why I became interested in the band and about what kept me interested. She also went out and reserved library books about the band and began reading everything she could find on the internet. By now I bet she could give many of you a run for your money in her knowledge of the band! She also set out to do as much research about me as possible, reading my posts on this site and later looking at my facebook page. I was and continue to be blown away by the amount of research and dedication Virginia has displayed throughout this project. As I confessed to Virginia, when I first contacted her, I really just wanted to have a painting done by the beautiful maiden from TSRTS. I liked her artwork and thought it would be a neat piece to own. Win/win. Very quickly in the process I forgot that Virginia was ever involved with the movie. 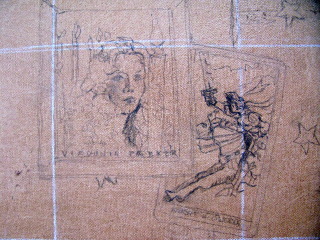 As the idea morphed from a kitschy portrait (my suggestion) to a very personalized piece of art (her vision), it became irrelevant to me that Virginia had been in the film. I realized that she would have been the right person to paint this regardless. It was nice, however that she too had a personal connection to this painting given her appearence in the film. It was neat to get to watch her revisit her past as we planned out the painting. 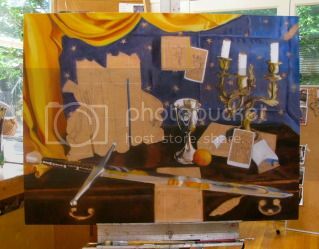 In fact, it was in looking for props for the painting that she (quite accidentally) discovered her receipt from the TSRTS film job which she posted in the “who is” thread. 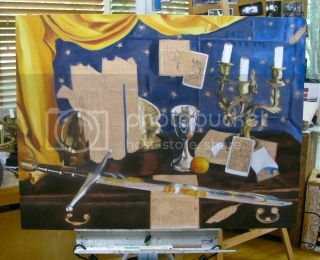 She ultimately came up with a list of items that would go in the still life and started to source them. "I think I have a lead on a sword" she told me, and she would scour eBay for other items. She asked for a copy of my O2 ticket stub and set out to find (and did find) a fur like that which Plant wore in the film (though I don't think the fur made the final cut). Also, in a nod to my original idea, she decided she would paint a small portrait of herself hanging in the background over top of the Knight of Swords Tarot card. 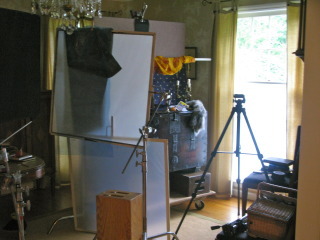 She built a set (pictured below) and arranged and rearranged and rearranged the props taking photographs until they looked just right. Closeup of her portrait and Knight of Swords Tarot card. The picture above is where we are today. Virginia advises that things will slow down now as she starts to work on the more detailed items. She is hoping to have the painting complete by the end of the year. I will post updates here from time to time. This will give you all something to follow (now that the countdown is over) while you wait for Celebration Day to be released in theatres! Been keeping up with the progress on fb. Glad to know the painting will be in your hands, Dandu! 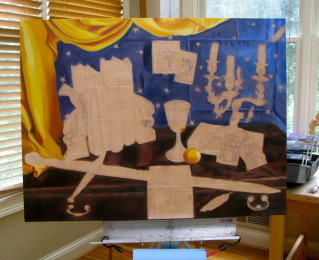 This is very cool Dandu- please keep us posted on the painting's progress! This is great, Dandu! I can't wait to see the finished piece. It's cool to read about what goes through an artist's mind during the creative process. Since I have no artistic ability at all, I had no idea! Thanks for including us in this journey. Virginia seems like a very fascinating woman! Definitely want to follow the progress. Fascinating project to say the least. Count me in if signed lithographic prints of the original artwork could be made available for purchase. Dandu, everything sounds absolutely wonderful. I read the "Who is" thread -I didn't participate myself- which I found really "catching", because it's so interesting that a person like Virginia happened to sign in here almost accientally and discovered "a world" of cheerful people to welcome her! Indeed, I saw a lot of admiration and dignity, and that's good. I think you've been pretty "brave" to ask her to fulfill this great misson for you and maybe if I had been older I'd have done the same. Lastly, I've recently fallen in love with BBC Session. So thanks again Virginia, if ever you read this post, you have really got a fabulous taste in everything! Are you writing the original text or a translation? Being Italian, I'm studying Dante's Inferno right now! I know many parts of the book by heart. By the way, I guess you are quite passionate about Italian literature (judging from the Petrarch quote in your signature), aren't you? all trembling, kissed me on my mouth. That day we read in it no further. Sadly, I cannot read or speak Italian beyond a few basic words, though I have spent some of my happiest hours with the paintings and sculptures of Firenze, Venezia e Roma. And don't get me started on the gelato. Here's the start of the sword. The metal blade is a series of abstract reflections and the hilt is wrapped leather. 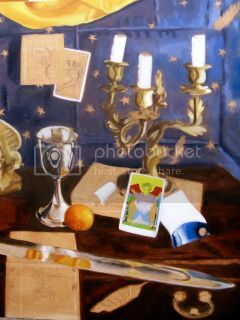 White went on the candles, reflections in the chalice and sword, the edges of the tarot cards, and the concert ticket. To become truly luminous, you need more layers of white than you'd believe. I've learned to start building them from the get-go, White is also is the slowest pigment to dry, another reason to add a layer every chance you get. A lot of blending of edges went on, but I'll spare you that. Six hours, well spent. I think it is becoming apparent to everyone here, from your posts and your painting, that everything I said above about working with you is accurate - if not understated. 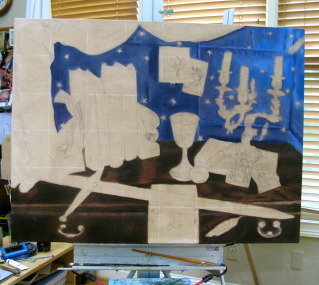 Roughed in the candelabra (on the right). It's one of a pair of French bronze d'or candelabras. The way the light struck it, the jump in value, between bright and dark, is why I wanted this particular photograph to work from, out of all the ones I shot. 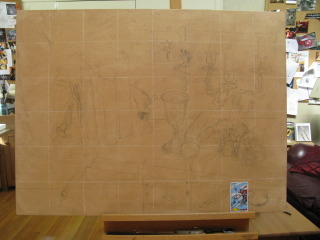 The final image will have an even starker contrast of light and shadow. The three candles will be lit, except for the fallen candle stub, which is snuffed out with a curled, burnt wick. Today I thought about adding a barely visible burnt wick on the other end of the extinguished candle, a nod to Edna St. Vincent Millay's poem. Also messed around with the reflection patterns on the sword blade. That will probably go on until the day before I varnish it. I'm no art expert, but I swear that sword looks like it's bound to pop out of the canvas in a second. Fantastic work so far and can't wait to see the finished result! Thanks. It's not trompe l'oeil by any means, but certainly realism. The sword breaks over the edge of the chest intentionally, to add a sense of destabilization and suggest impending movement. If I do my job right, in the end you'll imagine you could grasp the handle. Well, in the right light, after a few drinks. 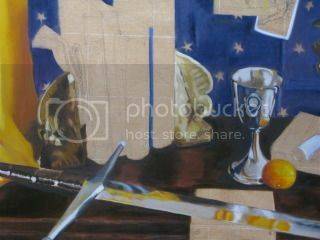 Thanks to the links on this site, I listened to the LZ press conference while I painted the chalice. Patiently did lots of fine detail, because that's all it is. Blended very carefully. The reward is that it will only require a few more layers to be complete. This morning I roughed in the two hawk marble bookends. It took three hours, but at least half an hour was spent cleaning up my palette and mixing paint. 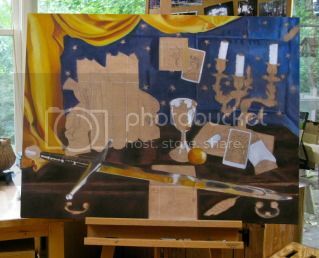 At the end of the day, I painted in the hilt of the sword by cleaning off my brushes. Sometimes you can get the best neutrals from a dirty brush. Here's a detail of the hawks - the one on the left has a broken beak. I'm going to look at the unbroken one in a mirror to figure out how to paint it. I listened to No Quarter on my iPod. Really liked a song I'd never heard, Yallah. Reminds me of my travels from Tangier to Taroudant to TanTan. i like your new work. you changed the sword in a few points. a shiny blade without a fuller. That's an easy one. It's a two part answer; the painting references Led Zep lore rather than copies anything directly. For example the hawk bookends refer to Plant's symbol of a feather in a circle, the chalice represents the rescue of the maiden, the tangerine fruit indicates the song. 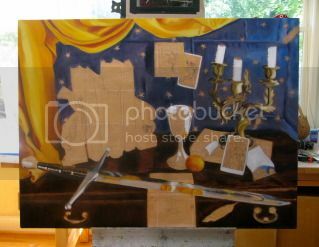 About the sword - while it refers to the sword used by the character Plant played in the movie fantasy, genuine broadsword is far too long for the scale of the painting. I borrowed this sword from a friend - actually two swords - and the result is a combination. Plus, I love reflections. Virginia, the painting is looking fantastic! I was curious about the dimensions. Also, is this a stretched canvas or on lauan or masonite? The dimensions are 30" x 40". I think it’s on canvas, but Virginia will know for sure. Hey Jabe. It's 30x40" and stretched canvas, well braced. It's big by my standards. It's size equivalent of twelve of my tomato & knife paintings. I'm working on the ticket and/or tarot card today. Focused in on details of the O2 concert ticket, and The Lovers Tarot card. The concert ticket has a slice of planet earth with faint latitude/longitude grid lines and narrow spires of (what I'm thinking are) old fashioned radio towers. Maybe someone here knows for sure? EDIT: None of the above - in fact it's a view of the O2 arena itself, a tensile structure. "Most tensile structures are supported by some form of compression or bending elements, such as masts (as in The O2, formerly the Millennium Dome), compression rings or beams." Thanks Dan and Wikipedia. The round hologram above it reminds me more of the moon than the sun and there are pinpoints meant to be stars. There's some refining details to come here, with the printed words last. Making those stratas of blues was a pleasure, and pondering what I'm going to do for the hologram is perplexing. Still thinking about it. 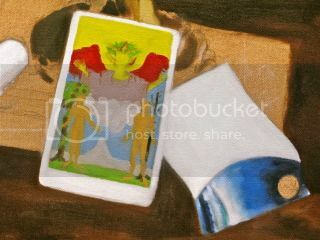 The Tarot card is simple; vibrant hues, mostly primary colors, with every object and figure outlined in black. 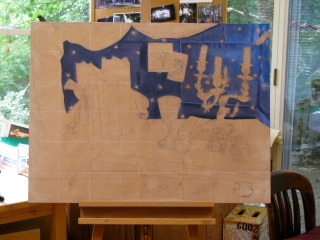 It will need to dry very throughly before I draw in the leaves, feathers, features of the three figures, etc. I was concentrating on not dragging or smearing colors into each other, yet smoothing and blending the edges between them. Not a task for the faint hearted. I listening to several versions of the song No Quarter. It set the right tone. After the loose volume and form of the marble bookends, doing the card's graphic design felt like painting a miniature. Even putting in the base color required my #0 and #1 brushes, but I like switching around from loose to precise. Artist's yoga. Looks great, Virginia! I have to say, you're an outstanding artist, and I can't wait to see the finished product!